Being a coastal city and the capital of Khanh Hoa province on the South Central Coast of the country, Nha Trang is one of the most attractive destinations for domestic and international tourists in Vietnam. Nha Trang special delicacies is considered as one of the most delicated specialities that visitors want to taste. If it is the first time you come and visit Nha Trang, Grilled Fish noodle would be the unforgetable dish for anyone who once try it. The broth is light, pure and a little sweet. It is stewed from bones of mackerel and sailfish. Grilled fish is made from fresh mackerel. Hence, each piece of grilled fish is very chewy, juicy and so fragrant. 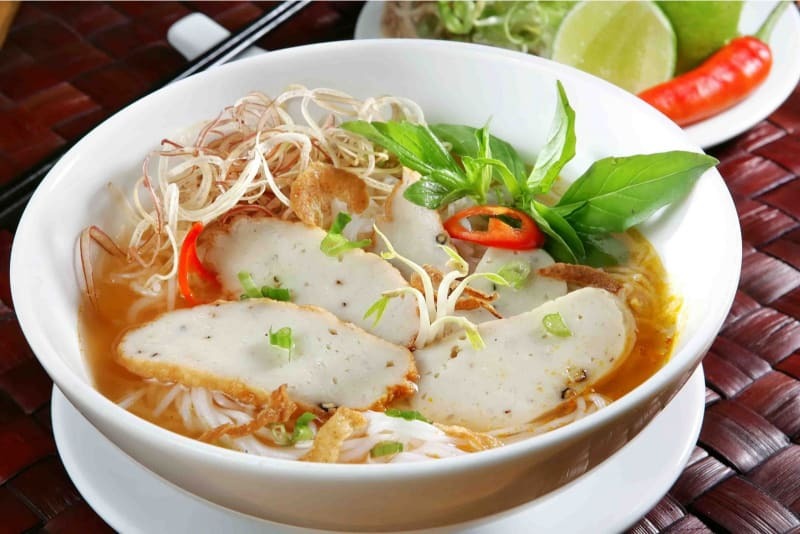 You will not stand against a bowl of vermicelli full of tasty chewy fish cake, fresh herbs and dipping sauce for sure. 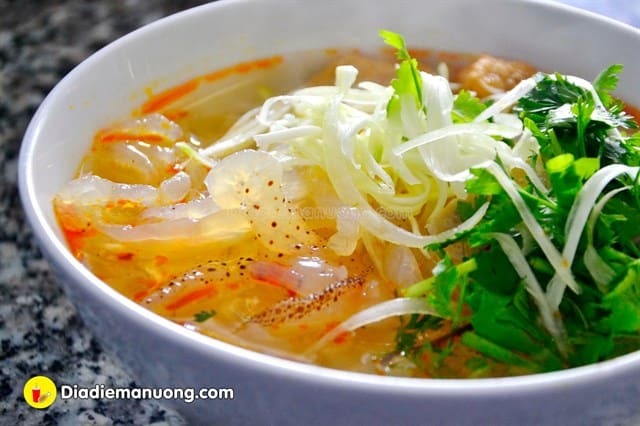 The dish comprises of rice vermicelli, jellyfish, and steamed sailfish fillet in a sweet and savoury fish broth. A popular breakfast amongst locals, you can find many vendors selling bun cha sua at Bach Dang Street and Nha Trang’s street markets. 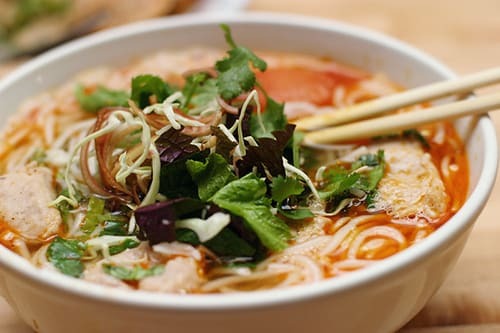 Part of noodle broth is extremely tasty and significant smell thanks to cooked from ponyfish, noodle and vegetables are put in a bowl, adding some fresh jellyfish and slices of Cha ca, then pour hot broth onto the bowl, it’s when your Jellyfish vermicelli is ready to serve. Banh cuon is sold at Nha Trang’s street markets and local restaurants which is perfect for a light breakfast. 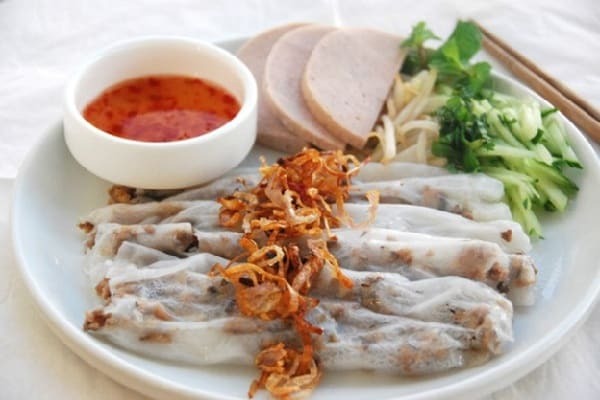 Banh cuon is a Vietnamese spring roll that contains ground pork, minced wood ear mushroom, and onions, these ingredients are loosely wrapped in a steamed rice flour crepe and eaten with Vietnamese ham (cha lua), steamed beansprouts, and cucumbers. The sauce is the key to this dish and simply put, is amazingly delicious. However, it is quite difficult for those who are not familiar with a sweet-sour dipping sauce made with fish extract, lime, and chilli. Squid pancakes in Nha Trang are similar to pancakes in Saigon but the stringkingly difference is from the smaller size and more crispy. In addition to the required ingredients, these pancakes also have fresh squid and shrimp. All squid are fresh and taken from the wharf to be washed and cooked immediately as the intention of preserving the freshiness. Having banh xeo with fresh vegetable and delicious sour, spicy fish sauce will create an extremely bold flavor which you find it hard to forget. 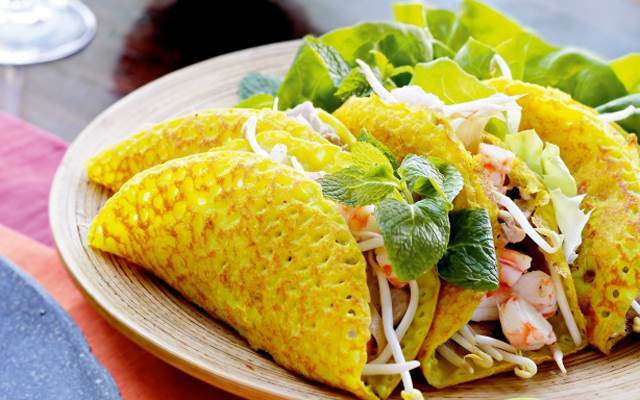 As a tasty dish you cannot miss, Nem Ninh Hoa has contributed to enrich Nha Trang cuisine. 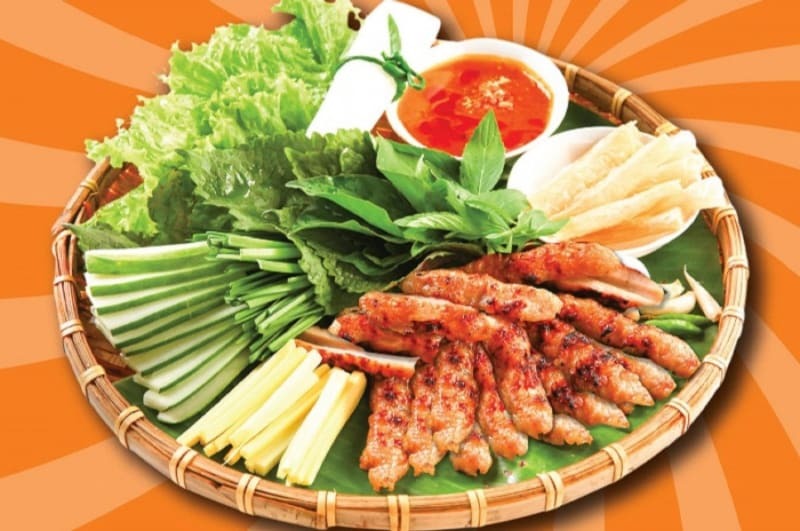 This food has 2 types, which are nem chua (fermented pork) and Nem nuong (grilled pork). 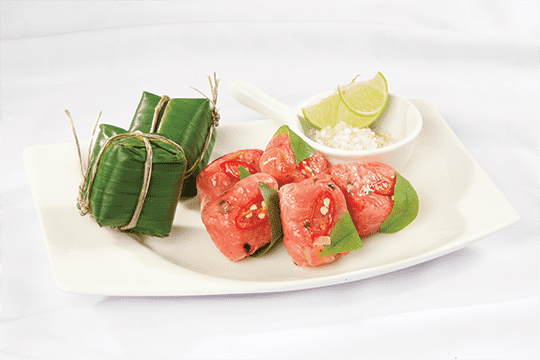 Nem chua is made from thigh and skin of a pig, which are marinated in special spices including hot spices and garlic, then rolled tightly in gooseberry leaf and wrapped by banana leaf. The main process of making Nem Chua is based on the fermentation naturally for 3 days, nem chua is available to serve. Nem Chua is completely handmade that remains the delicious taste of soft, sticky and sour fresh meat. You can try this food with vegetables and rice paper. Prior to grilling, the pork meat is heavily marinated in a paste made with garlic, sugar, and black pepper for several hours. It is then pounded into a paste, wrapped around bamboo and grilled until well cooked. The sweetness in taste is only appeared after a few moment you taste this tempting dish, nem nuong is also served with fresh herbs, pickled vegetables, and rice paper to wrap all the ingredients together. Nem Nuong served with vegetatable and sweet fish sauce. If you've read this far, DichungTaxi hopes that you have found useful information for your trip at Danang. >>> How to get from Cam Ranh Airport to City Center?